The Congress Party took a beating in India’s recent parliamentary election and has now been sidelined by the Hindu nationalist Bharatiya Janata Party (Indian People’s Party, or BJP). 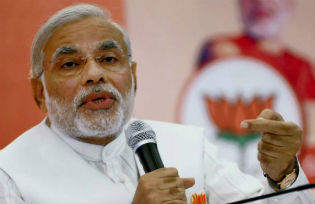 The spotlight is on Narendra Modi, the BJP’s leader who will be the next prime minister. A former tea vendor, Modi’s humble origins place him in a different world than the Nehru dynasty, which, via the Congress Party, has run India for all but a handful of its nearly seven decades of independence. Rahul Gandhi, Jawaharlal Nehru’s great-grandson, proved a dull campaigner — no match for the charismatic, silver-tongued Modi. There appear to be two Narendra Modis. The first is the lifelong RSS (Rashtriya Swayam Sevak Sangh, National Volunteer Society) acolyte. Its anodyne name notwithstanding, the RSS is a hyper-nationalist Hindu movement known for its martial drills, uniforms, and belief in the specialness, indeed superiority, of Hindu civilization. The movement is committed to “Hindutva,” which sees “Indian” and “Hindu” as interchangeable. Modi has been drinking deeply from the RSS well for years, which is why Indian secularists and non-Hindus, especially Muslims (India has 170 million), are anxious. The voters, disenchanted with the Congress, have put him in charge. Now the question is whether we’ll see Modi the ideologue or Modi the pragmatist. I believe the latter will prevail, though the former will inevitably make its presence known, both because Modi will periodically play to his BJP base and because his rhetoric is not just for effect: it reflects his deeply held beliefs. Since the BJP’s sweeping victory, there’s been much speculation in this country about what kind of foreign policy Modi will pursue. Don’t expect any drastic course correction. Modi will maintain India’s strong ties with Russia. There’s a long history of cooperation between New Delhi and Moscow that dates back to the early years of the Cold War. While trade and investment with Russia are now far less important for India, Moscow remains India’s chief arms supplier by far. Modi has no reason to rock that boat. China: Both the Congress and the BJP have long believed that China is India’s principal geo-strategic adversary. That outlook won’t change. Yet things have become more complicated over the last two decades: China is now India’s main trade partner, so the relationship is not all about security and conflict. The Cold War alignment with Russia as a hedge against China won’t be as effective a strategy. China has surpassed Russia in just about every measure of power. More importantly, the old Sino-Soviet schism is a thing of the past. Moscow and Beijing are united — and have been since the early 1990s — by what each calls a “strategic partnership”; they’ve put their territorial dispute to bed, Russia is China’s main weapons supplier, and Russian energy flows to China, as this week’s mammoth 30-year, 400-billion-dollar gas deal concluded by President Vladimir Putin and Chinese President Xi Jinping demonstrated rather dramatically. Add to all this the economic and military weakness of India relative to China, and Modi, though he is a nationalist who’s attacked previous Indian leaders for not standing up to China, won’t be looking to pick fights with Beijing. Modi knows that India can close the power gap with China only by achieving and sustaining high economic growth rates — that’s what made Beijing a global power after all. That means fixing what ails the Indian economy: corruption, red tape, and lousy infrastructure, for example. That’s going to take time, but expect Modi to shake thing up on that front. But there’s another reason why the economy will top his agenda: he knows that’s what Indians care about most and largely why they elected him. Indian economic managers have failed the poor. As a populist and a man who himself arose from modest circumstances, Modi wants to lift up India’s least fortunate. Pakistan will be Modi’s other foreign policy preoccupation, but he’s likely to prove wrong those who think he’ll take a dramatically tougher line toward Islamabad. He has already surprised people by inviting Pakistani Prime Minister Nawaz Sharif to his swearing-in ceremony and doubtless understands that intermittent confrontations with Pakistan will divert him from focusing on the economy. War with Pakistan has also become dicier given the risk of escalation to nuclear war. The wild card is a terrorist attack on India that’s traced back to Pakistan. Modi will find himself under tremendous pressure to act decisively, not least because the don’t-mess-with-India message is a key part of his appeal. India under Modi will continue to strengthen its ties with Israel. The BJP generally and Modi in particular admire Israel and believe that India’s traditional pro-Palestinian policy has earned it little goodwill in the Arab world, which, when the chips are down, backs Pakistan. Modi has visited Israel twice, professing admiration for its economic and technological achievements. Look for more cooperation on economic issues and intelligence sharing on terrorism. Israel can’t supplant Russia as an arms supplier, but India, already a major importer of Israeli arms, will likely buy even more Israeli weaponry, especially drones. Talk of an alliance between India and the United States to balance China is hyperbole. New Delhi and Washington have been steadily upgrading their defense co-operation over the years and that will continue; but neither country wants to commit to an alliance. One country with which Modi is eager to step up its security ties is Japan. The Congress laid the foundation for this, and the BJP will build on it. Japanese Prime Minister Shinzo Abe was the chief guest at India’s Republic Day celebration in January, and Modi has also invited him to his inauguration. India is the one Asian power that’s not unnerved by Abe’s commitment to change Japan’s minimalist defense policy. New Delhi wants a strong partner on China’s eastern flank and sees Japan, with its economic and technological prowess, as well suited to that role. Both Tokyo and New Delhi see China as their biggest security problem. Likewise, India will strengthen its ties with Vietnam, another Asian country that is deeply concerned about China’s territorial claims and intentions, as demonstrated by recent clashes between them in the South China Sea. In all, those expecting big changes from Modi on the foreign policy front are apt to be disappointed. While he believes that India is destined to be a global power, he also understands that that goal will never be met unless India gets its economic act together. If Modi makes big changes, they’ll be on the home front. Rajan Menon is the Anne and Bernard Spitzer Professor of Political Science at the Powell School, City College of New York/City University of New York and a Senior Fellow at the South Asian Center of the Atlantic Council.